TAGBILIRAN, Bohol. The Golden State Warriors came back from 25 points down to ​beat the San Antonio Spurs, 113-111, and take Game 1 of the Western Conference Finals on Sunday afternoon at the Oracle Arena. ​S​an Antonio ace ​Kawhi Leonard re-injured his left ankle after landing on ​Warriors center ​Zaza Pachulia's right foot​. Leonard exited the game with over seven minutes left in the third quarter and did not return. 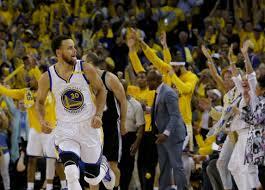 Photo: Steph Curry's 40 points fueled the Warriors' amazing comeback.